Bicycle Tree Gin from Skip Rock Distillery: A good story makes a good drink even better. Which is why it’s neat that the recently-released gin from Skip Rock is named after a famous old cedar that once stood on the edge of Snohomish (where the distillery is located). People traveled from all around to ride bicycles through a large arch carved in the middle of the tree; there were even postcards about it. It’s a great historical and local shout out, but the story’s not the best thing about the gin. That honor goes to the flavor, which is nice and dry with a classic juniper undercurrent, rounded out with northwest botanicals like raspberry leaf, mint, and rose hips. Hints of lemongrass, citrus and other spices combine into a very memorable personality. Try it solo, in a Martini with a few pieces of lemongrass added during shaking or stirring (and a lemon twist), or in a drink like the Lucien Gaudin. Liath Earl-Grey Infused Gin from Four Leaf Spirits: For those who don’t know, this Woodinville-based distillery develops and sources organic teas and herbal tea blends in conjunction with Seattle’s Remedy Teas, and then uses them to make tea-infused spirits. 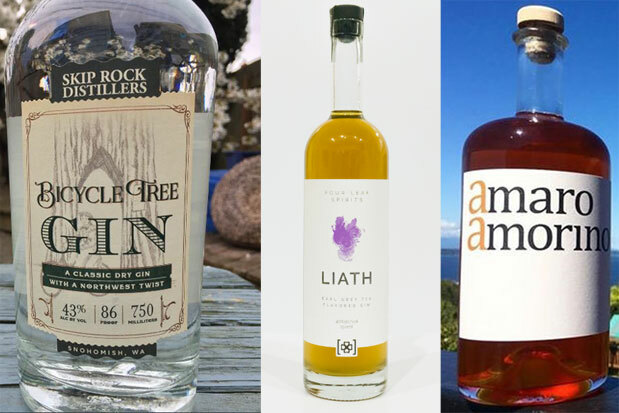 Its latest (now available at the distillery, with an official launch in May) is Liath, an Earl Grey tea infused gin. Its flavor starts out with traditional juniper notes, and then the Earl Grey comes on with a kick of citrus from the bergamot orange used in the tea. It’s very distinctive, and a fun British shout out with the gin and tea. It could be used like gin in a classic martini or sipped on its own over ice. I also think it’d make a dandy Violet Fizz. Amaro Amarino from Letterpress Distillery: Here's another local tipple with a good story. This amaro (Amari being herbal digestifs very popular in Italy) was named for distiller Skip Tognetti’s grandfather, Amorino Pinti. Raised in a hillside village, Pinti went on to open a neighborhood liquor store in Rome, where Skip used to hang out when he was young, learning the importance of spirits and wine in the community. This amaro has a lush Southern Italian flavor a stitch less bitter than some in the Amari family, while retaining a traditional, herbal backbone. Made with natural botanicals, it’s smooth but strong, with layers of citrus, herbs, sweetness, baking spices and floral notes. Try it neat or on ice after dinner, or in cocktails: sub it in for sweet vermouth in a Manhattan. It’s being released at noon at the distillery this Saturday the 29th, and on hand will be treats made with the amaro, suggested recipes, samples and more. Selkirk Barrel-Aged Glass Vodka: This Saturday from 10 a.m. to 5 p.m. at the distillery, Glass Vodka is unveiling its new limited-edition vodka. Aged in charred oak for over a year, this vodka is solely available at the distillery, as only 1,000 bottles have been produced. Each bottle is hand-numbered and signed by Glass founder Ian MacNeil. I’ve been told the vodka boasts notes of vanilla, caramel and oak—like some whiskies—and is named after MacNeil’s Labrador, Selkirk!